Leave your familiar world behind…and soak up the concentrated feeling of pure pleasure. Here, cars are banned. The shops, services and ski lifts are at your feet. Get skiing on 265 km of the finest pistes in France, try out the snowpark, take to the skies in paraglider or learn how to drive a car on ice. But also take the time to explore the wealth of history in this fantastic resort, where works by Picasso, Vasarely, and Dubuffet stand alongside several buildings listed as historical monuments. Be warned: you may have the time of your life. At an altitude of 2500 metres, the setting is truly exceptional. But what makes it really stand out above all else is the exquisite beauty of the landscape unfurling in front of you; guaranteed to take your breath away the first time you set eyes on it. Relax, let your imagination run wild and wait for the call of the mountain to ring out loud and clear. Ice driving, paragliding, helicopter flights, snowmobiling and indoor climbing. All you need to master these disciplines is a h int of technique, a touch of nerve and the slightest trace of madness. Then, let your imagination go wild as it comes up with great style techniques. Excitement comes as standard. 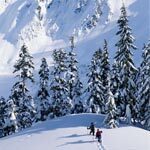 If you prefer the mountain a little less vertiginous, how about a dog–sled ride or snowshoe walk? With the ice rink, cinema, relaxation area and weights room, there really is something for everyone, so seize the moment and make it your own. And if you feel like sitting back and doing absolutely nothing, just go with it. Don't forget, you are on holiday! Free activities for all ages, bringing together the whole family with games and shows they'll love. Let children take their first steps or make their first foray into snow sports in the ski schools, nursery and kids' clubs. If there is a place where the phrase "I'm bored" is rendered useless, it has to be here. Saying that, there's no guarantee they won't start complaining that their holiday was far too short.